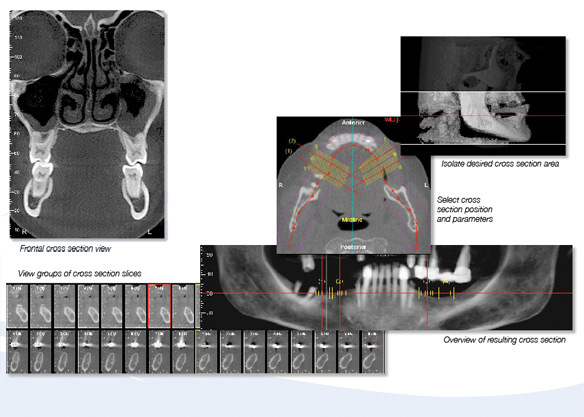 Dolphin	3D	software	is	already	widely	used	by	research/teaching	institutes and private practices worldwide. 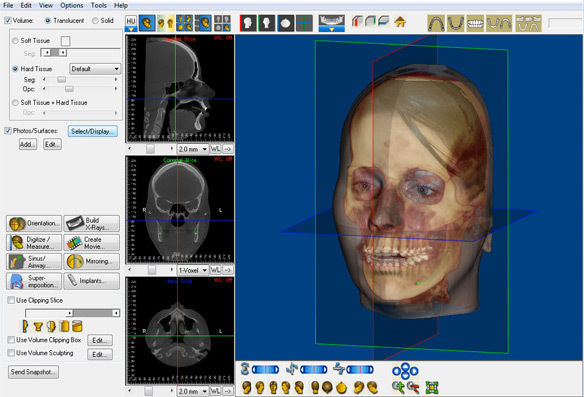 It features tools for onscreen manipulation and	analysis	of	volumetric	datasets:	Images	are	easily	oriented	and rotated, and tissue density thresholds can be adjusted for detailed views of craniofacial anatomy. Measurements and digitization can be performed in	both	3D	and	traditional	2D. The latest Dolphin 3D brings even more capabilities with the simplicity users have been raving about for years. 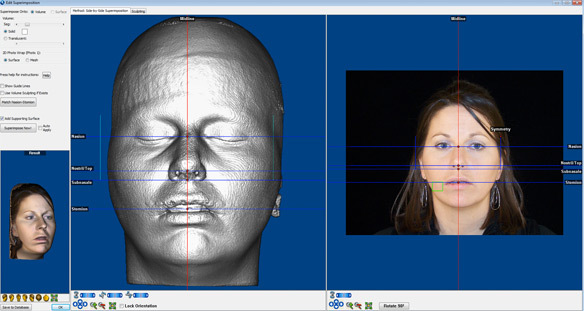 A new “face photo wrapping” tool lets you create a 3D facial surface image using the patient’s volume with an ordinary 2D photo. 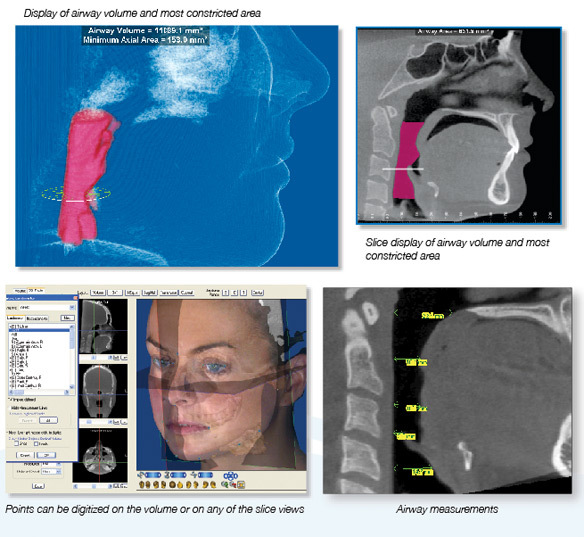 Airway/ Sinus Volume Analysis, Condyle Sculpting and Volume Superimpositions are just a few new features that make Dolphin the most clinically comprehensive 3D software. Dolphin 3D includes powerful yet intuitive tools for you to process multi-dimensional datasets. analyzing three-dimensional data has never been easier. such as translucent skeletal structures with translucent soft tissue 3D photo facial texture map (if available). tools help to further clarify anatomy and their spacial relationships. eliminate portions of the contents that are not relevant. To maximize the consistency of analysis of a 3D volume, it is crucial to establish a default orientation. 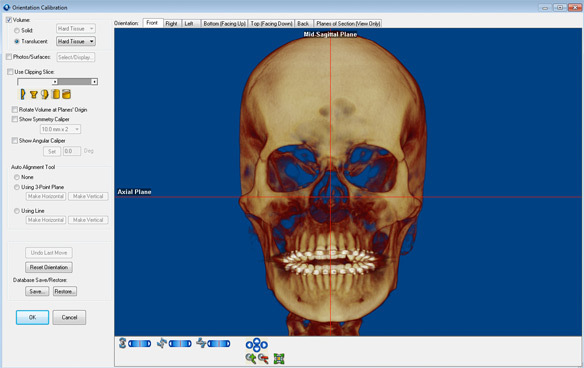 Dolphin 3D provides comprehensive tools for defining the mid-sagittal, axial and coronal planes. You can also adjust the object’s	default	yaw,	pitch	and	roll. These	operations	can	be	per formed	on the CT soft tissue surface, CT hard tissue surface or 3D photo surface. You	can	also	adjust	Window	Level	(traverse	through	12-bit,	14-bit	or	16-bit levels of intensity), zoom, pan, rotate, etc. Image	flters	help	emphasize	different structures	of	interest;	including:	MIP	(maximum	intensity projection), Ray-sum (academic standard) and a collection of Dolphin proprietary flters. (Dolphin	Ceph	Tracing	software	required	for	2D	analysis). scan;	the	program	will	automatically	fll	in	and	display	all	the	airway	space	within	that border, then report back telling you the volume of airway space in cubic millimeters. I will also locate, display and measure the most constricted spot of that airway. Landmarks	can	be	used	in	a	3D	analysis	or	translated	into	identifed	2D	lateral	or frontal	cephalometric	analyses,	such	as	Roth-Jarabak,	McNamara,	etc. Further,	the 2D	points	can	include	x-ray	magnifcation	to	be	compatible	with	existing	norm	values. Digitized landmarks can be saved in Dolphin Imaging and exported to a Microsof Excel spreadsheet or other numerical analysis programs. 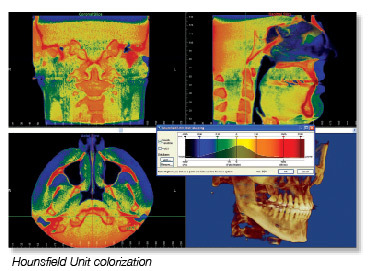 New in Dolphin 3D is the Hounsfield Unit Color Mapping tool, which helps you distinguish between different biological structures according to their radiolocency measurements. A graph displays the colors as they fall on the Hounsfield Scale as a reference, while the image on the screen is colored in accordingly. step process to add the photo to the 3D	volume. No	additional	device or add-ons are needed to create this wonderful visual identify to an patient’s	3D	volume. clipping and timing attributes, create a movie script which may be reused for volumes of other patients. Dolphin 3D then creates a smooth animated movie from your script. Spin,	fy-by	and	see-through	your	volumetric	object. volume for later viewing or for transfer to referring clinicians.